It has been a while since our last blog post on Greenbyte’s first AI powered offering, Predict. During this time we have been busy burning the midnight oil to make Predict more powerful and useful to our customers. Today, we intend to share the experience and feedback that we have gathered up until now and discuss how Predict is evolving. We in the Research team (The Dolphins) feel like the parents who talk about their child every opportunity they get. On April 1st, 2018 we had butterflies in our stomachs as our beloved child, Predict, left the comfort of the beta phase and stepped out in to the real world. Today, we are happy to say that Predict has detected 41 faults in various components and has registered an accuracy of 94%. Before we go further, I would like to introduce Predict briefly, for the uninitiated. Predict is an analytics tool which enables early detection of failure in certain components in the wind turbine. Predict utilizes artificial neural networks, small computational brains, to detect anomalies in different temperatures in the turbine, which then point to developing failures in the turbine components. the creation of a recommendation system. Now we have the ingredients, the recipe and talented chefs to make that amazing dish – or in our lingo, a tool that is powerful, user friendly, and smart. Machine learning and artificial intelligence are powerful tools. However, conveying the information from such tools in a language that can be easily interpreted by users is as important as the algorithm itself. In most cases, the asset managers, operators and analysts in the renewable energy sector work in a high-pressure environment where time is in short supply. Hence, it becomes essential to deliver precise, concise, and actionable information all in one place. One of the ways to visualize an alert from Predict is to compare the temperatures simulated by the artificial neural network (ANN) model and the actual temperature being measured by the turbine SCADA system, as shown in Figure 2.
could external variables such as abnormal ambient temperature be a reason for the anomaly? We realized that the information in Figure 2 will provide only part of the ingredients for that amazing dish. We need information about the difference between the estimated and the actual temperatures while considering the operating zones of the turbine and external variables it is exposed to. The operating zones of a wind turbine can be represented by the power it is producing. An analysis showed that the two external variables which will most strongly affect the turbine are wind speed and ambient temperature. Therefore, contextualizing a Predict alert in terms of power, wind speed, and ambient temperature reveals the information we’re looking for. 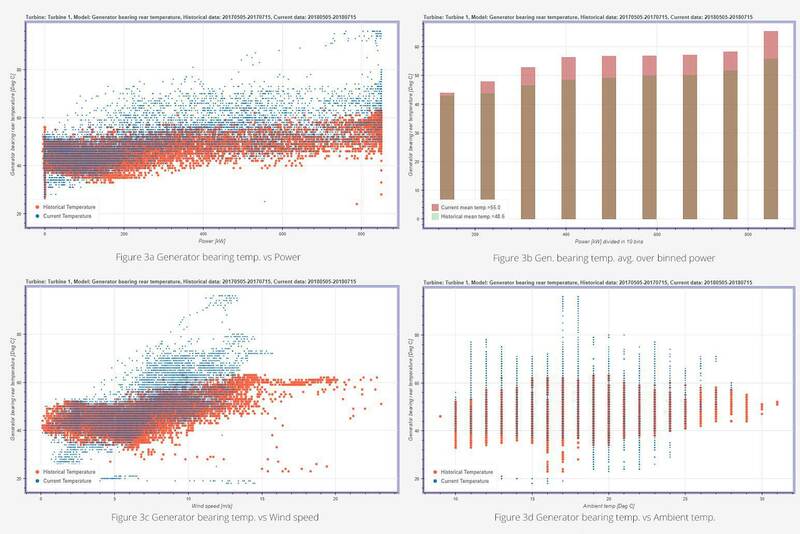 Figure 3 shows four different plots where the alert for Generator bearing temperature in Turbine 1 is represented with reference to these parameters. A characteristic of the ANN models, the computation tiny brains, is to learn from experience; in the case of wind turbines this means historical data. Predict uses the data from the past year to learn the behavior of the wind turbine components. So, to understand the reason for an alert from Predict, it is prudent to compare the current operation of the component to its operation from the past year. For example, in Figure 3, the component temperature which is responsible for the Predict alert (here generator bearing temperature) is plotted against power (a), wind speed (c), and ambient temperature (d). The data in red show the behavior of the temperature in the past year (in this case from year 2017). The data in blue indicate the behavior from the current year (in this case from year 2018). Like Figure 3a, Figure 3b shows the generator bearing temperature vs the power, but in Figure 3b power is binned and the average temperature is calculated for each bin. Thus, Figure 3b provides a clearer illustration of the average increase in component temperature. Nonetheless, from both the figures it is evident that the increase in temperature compared to previous year is more prominent when the turbine is producing higher power. Figure 3c shows the bearing temperature vs wind speed. The behavior shows that the increase in temperature is more significant at higher wind speeds, which (given the non-linear positive correlation between power and wind speed) is in line with what we would expect from Figures 3a and 3b. Finally, Figure 3d shows the bearing temperature with respect to ambient temperature. From Figure 3d we may conclude that the increase in the bearing temperature is not a result of abnormally high external temperatures, as the turbine was exposed to similar external temperatures in the previous year. The visualization presented in Figure 3 provides an intuitive justification for an alert from Predict. An experienced user should be able to judge whether to go ahead with a manual inspection following an alert based on this information. However, these visualizations miss one key piece of information: a sense of urgency. Specifically, how bad is the problem in the component? One important step in any project management methodology is to prioritize the work. In the case of wind turbine maintenance as well, it is imperative to prioritize maintenance activities. Hence, one needs to know which of the faults detected by Predict should be the highest priority. Temperature trends over time allow users to decide the urgency with which an alert from Predict should be addressed. Canonical correlation analysis is utilized to find a linear combination of parameters that have the highest correlation with the signal that led to the Predict alert. This model is then put to work to estimate the expected value of the signal, and the deviation of the actual value vs the expected value is shown over time. Figure 4 presents the trends of this deviation between expected and actual temperatures in the turbine converter system of two turbines. The trends are plotted over a period of two years to provide a long-term perspective of the change in the temperatures. The converter temperature for Turbine A has been increasing over time and has stabilized to a new, albeit higher, value. The trend in deviation of temperature for Turbine B shows that the increase has been constant, and it is continuing. The deviation for Turbine B is above the extreme limit, showing that the issue in Turbine B might be more serious than the one in Turbine A. Hence, maintenance on Turbine B should be scheduled as soon as possible. For both Turbines A and B, there is an active alert. It is also interesting to consider the behavior of the trends for two other cases: when there is no alert from Predict, and after the user has taken an action to fix an issue identified by Predict. For Turbine C (in which there was no indication of a fault), the temperature does not cross the High limit, as might be expected. For Turbine D on the other hand, there was an alert from Predict and maintenance was performed. Following this maintenance in early September, it is clear that the temperature has come back to normal. Identifying that an anomaly exists in a component in a turbine within your portfolio is only the first step of the process. To achieve focused and efficient maintenance, it is important to understand the potential causes for an increase in component temperatures. The anomaly detection process is based purely on data from the turbine, whereas the recommendation system, which provides potential reasons for the increase in temperature, must be built upon the experience of the users. To illustrate this, we look at faults detected by Predict in the central hydraulic system of two turbines. Figure 6 shows the plot of hydraulic oil temperature vs power and wind speed for two turbines. Following an indication from Predict and after further investigation on site, it was apparent that the same component had failed in both turbines. The behavior of component temperature is similar for both turbines, that is, a larger deviation in low power regions and smaller or no deviation when the power is higher. The case study indicates that different failure modes will manifest discernably different patterns or fault signatures. The upcoming improvement in Predict will include a continuously evolving recommendation system. The recommendation system will describe the most probable cause for the alert and recommend the best course of action to tackle the issue. Today, we are in the process of building this system. It will be based on a feedback tool embedded in the product which will allow the users to seamlessly provide information about which components have been repaired/replaced following an alert. Predict will gather and learn from this feedback over time, continually strengthening the recommendation system. The users of Predict will be able to anonymously share information and by doing so streamline the maintenance of their turbines: a win-win situation for all. Predict has proven to be successful in providing increased value to our customers. In addition to developing the Predict as a part of the Greenbyte Energy Cloud offering, we are working on providing Predict as a stand-alone solution. The success of Predict has also motivated us to examine different ways of utilizing AI methods. Predict is a temperature-based condition monitoring system, and hence does not utilize a large portion of the data that is available in a typical wind turbine SCADA system. Furthermore, temperature analysis will not be able to detect faults in certain components, like the blades, for example. Hence, the next natural step for us was to start investigating Deep Neural Network architectures to create models which could utilize all available signals from the SCADA system. We have worked extensively on this for the past six months and are very close to a working prototype. Expect more about the next AI offering from Greenbyte soon. Missed the memo? Read part 1 and part 2 of the Greenbyte recipe for AI. Interested in seeing Predict? Find out more here.